Distinctive features: Electronic stopwatch and calculator combined. Display is 8 digits, blue-green vacuum fluorescent. Four function, %, memory, square root, stop watch functions, time calculations. 74 x 133 x 30 mm. (2.9" x 5.25" x 1.2"). 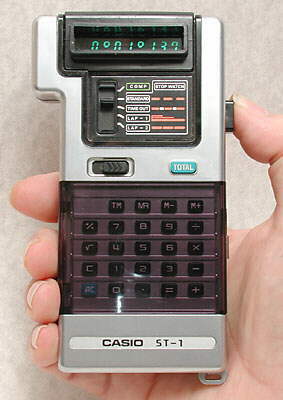 Casio Computer Co. Ltd., Made in Japan. 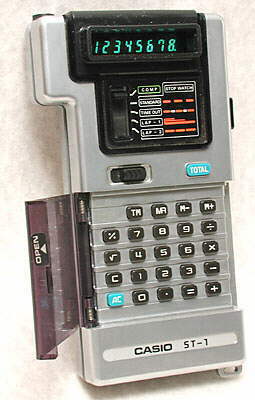 Here the Casio ST1 is being used in Stopwatch mode, with the cover in place over the calculator keyboard to prevent any buttons being pressed. Note that the display is deeply recessed to make it easier to be seen outdoors in bright light. Below the display is the switch for selecting COMP (computation) mode, or one of the timer modes. Here the display is showing 1 minute 13.7 seconds. There were other calculators of this period which had timing or stopwatch capabilities, but this was one of the first designed specifically to be used as a stopwatch. Around this time the pure electronic stopwatch was developed, but that is another tale.